Euroscepticism is becoming increasingly popular in Europe as the EU authorities fail to meet people’s expectations and solve their problems, experts told Sputnik, commenting on a recent poll that showed the idea of Brexit-like referendums is gaining popularity across the European Union. MOSCOW (Sputnik) – According to the IFop’s poll prepared for Sputnik, the number of people who would support such a referendum has increased by 7 percent in Italy since July and now stands at 53 percent. The number of supporters of a vote on EU membership has also increased in Spain and Poland by 5 percent, to 39 percent and 38 percent, respectively. 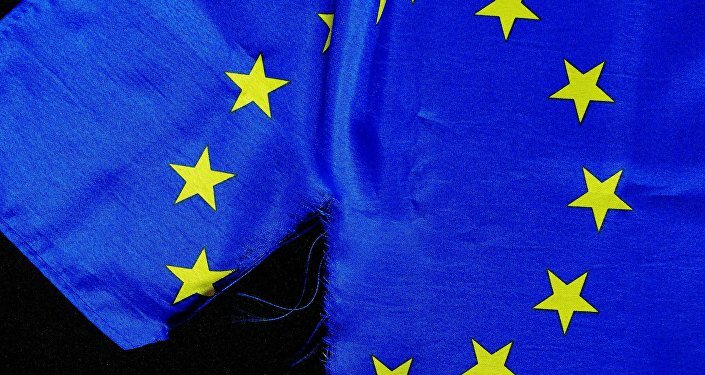 "The Euroscepticism is rising in EU countries as citizens of these countries are making sure every day that EU leaders are not competent, solving whichever problems except those of ordinary people," Spanish political analyst Enric Ravello Barber told Sputnik. He said that the best example of the problem is the EU policy of accepting migrants and refugees despite people’s wish to keep the borders closed. "In this context there is an illustrative example of Hungary. The referendum on refugees made people’s position on the policy of open borders clear. This factor played a crucial role in the outcome of the referendum on UK leaving [the European Union]," Barber said. He added that the idea of the European Union was good as only being together the European countries can be a real power like the United States and Russia. "Another question is that it must be a real union, not a dictate of some states … I am speaking here about Germany and its leader Angela Merkel, who from my point of view is responsible for the rise of the number of eurosceptics," Barber added. Another Spanish political analyst Argelio Garcia echoed Barber's statement that the EU bureaucrats were not solving problems of ordinary people. "I am not surprised by the rise of Euroscepticism in EU countries especially in countries such as Italy and Spain. Deteriorating economic situation in these states is, from my point of view, the main reason. The policy of austerity promoted by Brussels is damaging prosperity of ordinary people, who are lacking money," he said, adding that at the same time large corporations and banks are thriving. From his point of view European media turned into tools of propaganda. "Along with economic problems, attacks on freedoms in EU are being intensified … Every alternative point of view is immediately condemned," Garcia said adding that the EU resolution aimed at counteracting Russian media is a natural result of the EU policy. He added that the anti-Russian policy of the European Union also contributed to the rise of euroscepticism as many businesses, especially those in the agricultural sphere, suffered significant losses after losing access to the Russian market.